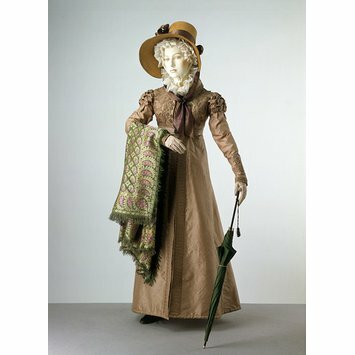 This is an example of a 'pelisse robe', or a dress in the style of a coat. It was often worn for walking or visiting during the day. 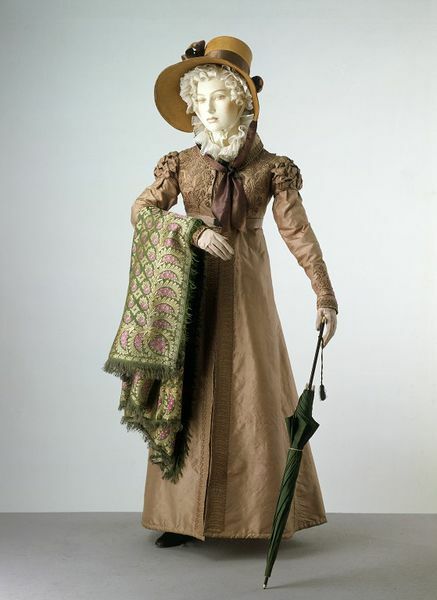 Unlike most other dresses of the period, the pelisse robe opens down the front and has a wide collar. This particular dress is very elaborately decorated with piping (very thin rolls of fabric) and interlaced rolls made of the same silk. The skirt of the dress is cut in an A-line shape, and the hem padded to accentuate this shape. Pelisse robe of silk with a fairly high waistline to which is attached a slightly gored skirt with a gathered panel at the centre of the back. The collar is stiffened and has a vent at the back, and trimmed with a tassel. The sleeves are long with short puffed over-sleeves of stepped bands, faced and lined with silk satin, and wristbands which fasten with a button. The coat is trimmed with applied piping arranged in flower shapes on the bust, at the wrists and in elongated curves on the skirt borders. It is lined with blue silk and padded at the hem. The coat fastens with loops and concealed buttons. The bodice is lined with cotton.